This shows a step by step progression of one of my gourds. Step 1: After cleaning the gourd thoughly, I like to color the inside of my gourds using spraypaint. Any cutouts such as the arrows shown above are done before painting the inside. I use a mini sized jigsaw and it has made cutting out complicated areas a breeze! I usually spray paint the inside of my gourd with black enamel. Step 2: I do my carving and pyroengraving next. I use a professional woodburner and a Micromotor or Dremel tool for the carvings. Step 3: I finish the gourd by painting with acrylics (I do a lot of sponge painting) and spraying the completed gourd with a clear enamel spray. Step 1: Gourd is carved to raise longhair kachinas in relief. The whiltish areas are where the carving has been done. Corn symbol on left has been recessed for inlay. Kachinas have been pyroengraved. Step 2: Inlace inlay and turquoise chunks have been added to recessed area, and ground smooth. 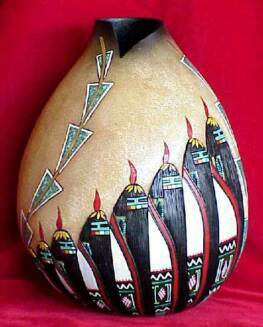 The Finished Gourd - "Rain Spirits"
The gourd has been painted and sealed. Spray paint was used to get the airbrushed effect on the top rim. Sponge painting was used for the background. Acrylic paints were used for the design. 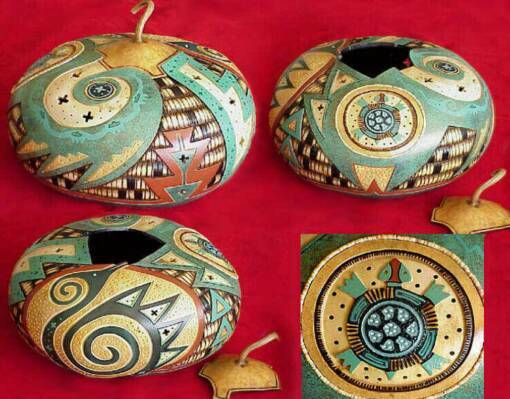 Multiple views of the finished gourd. The colored areas have been painted with acrylic paints. 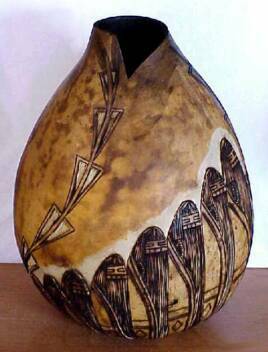 The tan areas are the natural color of the gourd. 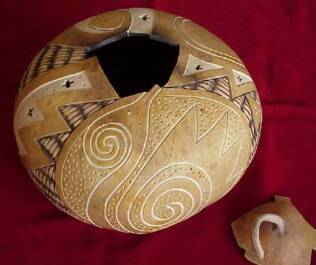 This is a gourd with a lot of carving! It took several days to finish this one. These two photos show the gourd before it has been painted, but all carving and woodburning has been finished. 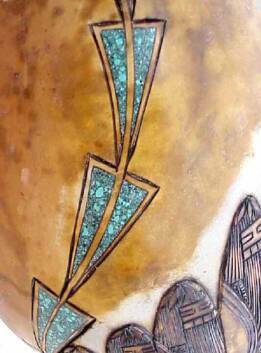 The lighter colored areas show where the carving has cut through to the lighter, inner layer of the gourd. 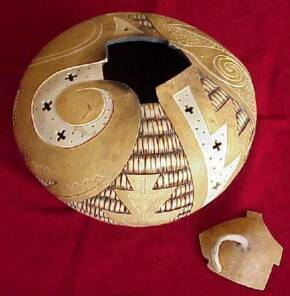 The inside of the gourd has been spraypainted black. Looking for a mini jigsaw or a woodburner? You will find them on the MiniTools and Woodburner pages on this site.